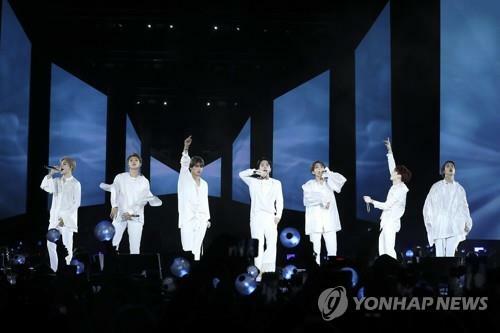 SEOUL, Oct. 10 (Yonhap) -- South Korean boy group BTS ranked 24th on the Billboard's main albums chart with its latest album, "Love Yourself: Answer," according to the chart, which was updated on Tuesday. The album was up a notch on the Billboard 200 for the week of Oct. 13 from last week's 25th and has now been on the list for six weeks since it debuted in the top spot on its release on Aug. 24. It was BTS' second No. 1 on the highly competitive album chart, following the "Love Yourself: Tear" extended player, making the K-pop septet one of the few global artists to achieve two No. 1 albums. BTS also claimed the top spot on the Billboard Social 50 chart for the week, meaning it's been there for an unprecedented 65 weeks. It was fourth, up a notch from the previous week, on the Billboard Artist 100 chart. The seven-member group is scheduled to continue its world tour in European cities including London, Amsterdam, Berlin and Paris this week.